NCERT Textbook Solutions are considered extremely helpful when preparing for your CBSE Class 10 Physics board exams. TopperLearning study resources infuse profound knowledge, and our Textbook Solutions compiled by our subject experts are no different. 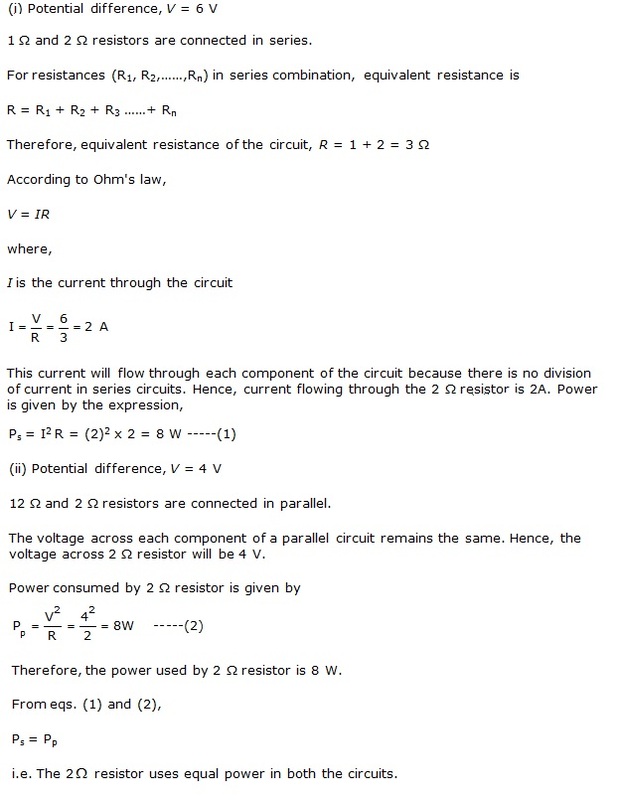 Here you will find all the answers to the NCERT textbook questions of Chapter 12 - Electricity. All our solutions for Chapter 12 - Electricity are prepared considering the latest CBSE syllabus, and they are amended from time to time. Our free NCERT Textbook Solutions for CBSE Class 10 Physics will strengthen your fundamentals in this chapter and can help you to score more marks in the examination. Refer to our Textbook Solutions any time, while doing your homework or while preparing for the exam. An electric circuit is a continuous conducting path that consists of electric devices, switching devices, source of electricity, etc. connected by conducting wires. Concept Insight:- The figure given below is an example of an electric circuit. The unit of electric current is ampere (A). 1 ampere is defined as the flow of 1 coulomb of charge through a wire in 1 second. One electron possesses a charge of 1.6 × 10 -19 C, i.e., 1.6 × 10 -19 C of charge is contained in 1 electron. Therefore, 6.25 x 1018 electrons constitute one coulomb of charge. If 1 J of work is done to move a charge of amount 1 C from one point to another, then it is said that the potential difference between the two points is 1 V.
Concept Insight:- The amount of work done to move to each coulomb of charge is equal to the energy given it. (a) Material of the conductor, i.e., resistivity of the material. Thicker the wire, larger is its area of cross-section and hence lower is the resistance of the wire. Therefore, current can flow more easily through a thick wire than a thin wire. Concept Insight:- The current flowing through the component is given by Ohm's law. The potential difference is reduced to half, keeping the resistance constant. Let the new amount of current be I '. 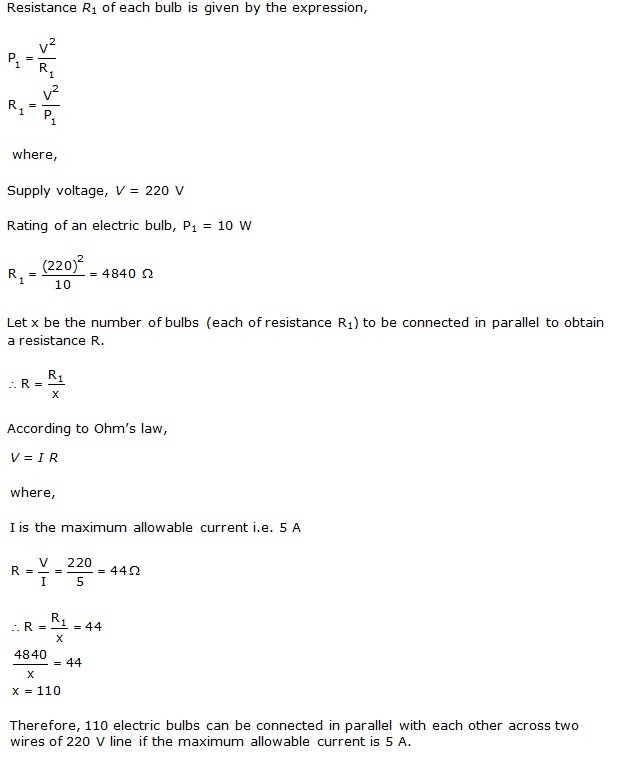 Therefore, from Ohm's law, we obtain the amount of new current. Concept Insight:- Resistivity and melting point are two important factors here. (b) It can be observed from the table that the resistivity of silver is the lowest among the listed materials. Hence, it is the best conductor. Concept Insight:- Less resistivity means better conductance. Three cells of potential 2 V each connected in series, is equivalent to a battery of potential 2 V + 2 V + 2 V = 6V. The following circuit diagram shows three resistors of resistances 5 ohm, 8 ohm and 12 ohm respectively connected in series with a battery of potential 6 V and a plug key. Concept Insight:- The voltages of cells in series add up to give the final voltage. To measure the current flowing through the resistors, an ammeter should be connected in the circuit in series with the resistors. To measure the potential difference across the 12 ohm resistor, a voltmeter should be connected in parallel to this resistor, as shown in the following figure. 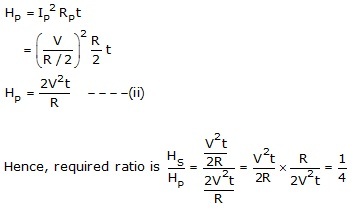 Concept Insight:- Ohm's law can be used to obtain the readings of ammeter and voltmeter. Therefore, the resistance of the electric iron is 31.25 Ω and the current flowing through it is 7.04 A. Therefore, the resistance of the electric iron is 31.25Wand the current flowing through it is 7.04 A. 1. In parallel circuit, if one electrical device stops working, then all other devices keep working normally. This is not the case when devices are connected in series. 2. There is no division of voltage among the appliances when connected in parallel. The potential difference across each appliance is equal to the supplied voltage. In series circuit, the applied voltage is shared by all the appliances. 3. The total effective resistance of the circuit can be reduced by connecting electrical appliances in parallel. In series combination, the total effective resistance of the circuit increases. (a) The following circuit diagram shows the connection of the three resistors to get a total resistance of 4 Ω. Concept Insight:- Here, 6 Ω and 3 Ω resistors are connected in parallel. Hence, the total resistance of the circuit is 4 Ω. (b) The following circuit diagram shows the connection of the three resistors to get a total resistance of 1 Ω. There are four coils of resistances 4 ohm, 8 ohm, 12 ohm, and 24 ohm respectively. 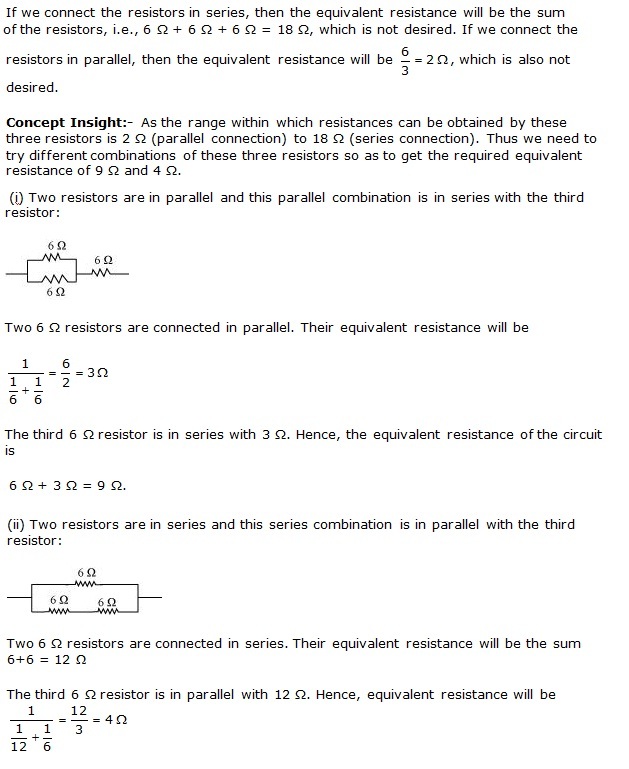 (a) Concept Insight:- For getting the highest resistance from a combination of resistances, connect them in series. 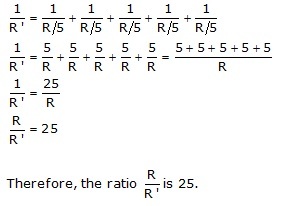 If these coils are connected in series, then the equivalent resistance will be the highest, given by the sum 4 + 8 + 12 + 24 = 48 ohm. Therefore, 48 ohm is the highest total resistance that can be secured by the combination of given resistances. (b) Concept Insight:- For getting the lowest resistance from a combination of resistances, connect them in parallel. Therefore, 2 ohm is the lowest total resistance that can be secured by the combination of given resistances. Concept Insight:- The amount of heat produced in a conductor is proportional to its resistance. The resistance of the heating element of an electric heater is very high. As current flows through the heating element, it becomes too hot and glows red. On the other hand, the resistance of the cord of the heater is much lower, so it does not become very hot and does not glow when current flows through it. Concept Insight:- Power of an appliance determines the rate at which electrical energy is delivered to it. Concept Insight:- Power of an appliance can be determined by the rate at which electrical energy is delivered to it. Resistance of a piece of wire is proportional to its length. The given piece of wire has a resistance R. The wire is cut into five equal parts. Both the wires have the same resistance because they are made of the same material and have equal lengths and diameters. 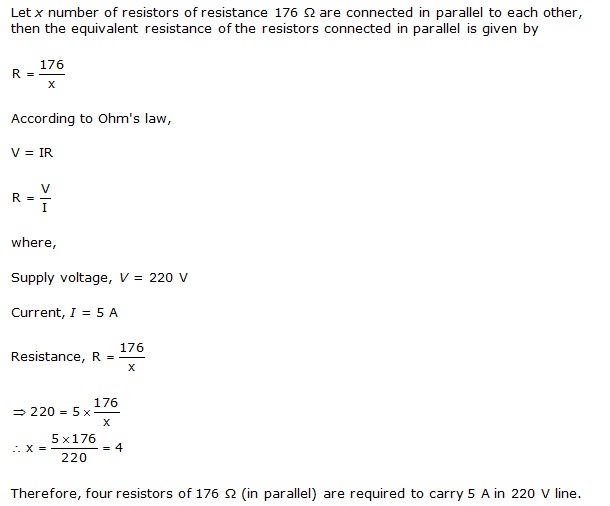 Let the resistance be R.
Let the current through the series combination be Is and heat produced in the circuit be Hs. Let the current through the parallel combination be Ip and heat produced in the circuit be Hp. Therefore, the ratio of heat produced in series and parallel combinations is 1:4. To measure the potential difference between two points, a voltmeter should be connected in parallel across these points. Concept Insight:- Voltmeter is always connected in parallel to the element of any electrical circuit across which potential difference is to be measured. Therefore, the length of the wire is 122.72 m.
So, if the diameter of the wire is doubled, the new diameter = 2 × 0.0005 = 0.001 m.
Let the new resistance be R'. Therefore, the new resistance is 2.5 Ω. The VI graph is shown below. The voltage is plotted on x -axis and current is plotted on y -axis. Concept Insight: - Convert all the quantities in the same unit system and then proceed to calculations. Concept Insight:- In a series combination, current flowing through all the components of the circuit is the same. 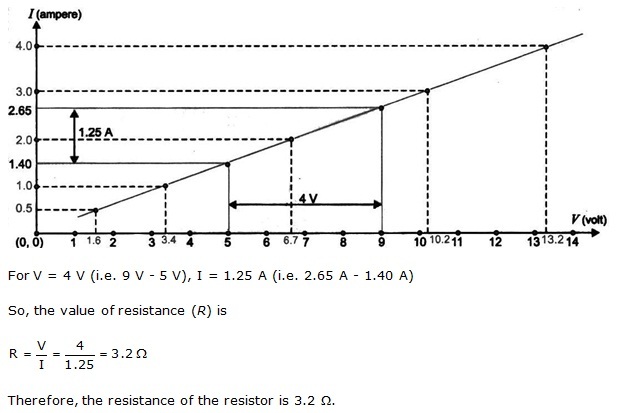 Let, R be the equivalent resistance of resistances 0.2 ohm, 0.3 ohm, 0.4 ohm, 0.5 ohm and 12 ohm. These are connected in series. Hence, the sum of the resistances will give the value of R.
Concept Insight:- The voltage across each component of a parallel circuit remains the same. (a) The melting point of tungsten is very high, so the tungsten filament can be kept white-hot without melting away. Hence, tungsten is mainly used almost exclusively for filament of incandescent lamps. (b) The conductors of electric heating devices such as bread toasters and electric irons are made of alloy because resistivity of an alloy is generally more than that of pure metals of which it is made. It produces large amount of heat. Moreover, at high temperatures, the alloys do not melt readily. (c) In a series arrangement, if any one of the appliances fails or is switched off, then the flow of current through the entire circuit stops and all other appliances stop working. Thus series arrangement is not used for domestic circuits. TopperLearning provides step-by-step solutions for each question in each chapter in the NCERT textbook. Access Chapter 12 - Electricity here for free.